Add shredded coconut to a food processor or high speed blender and pulse a few times to combine, careful to not over mix or you'll end up with coconut butter. Add in the coconut cream, maple syrup, and melted coconut oil and pulse until well combined, scraping down the sides as needed. If the mixture looks too wet, add a little more coconut flakes. If it's too dry and crumbly, add a little more coconut cream or coconut oil. You want the mixture to stick together when pressed with your fingers, but not soggy. Measure out heaping ~1.5" TBSP and scoop onto a parchment-lined baking sheet or plate. Transfer plate to the refrigerator or freezer to chill while you prepare the chocolate. Melt dark chocolate in a saucepan over medium low heat. stirring often. 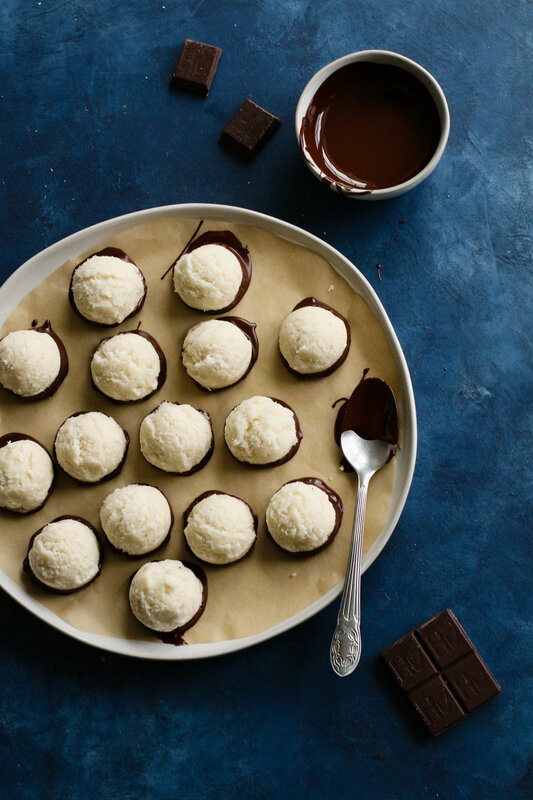 Dip the macaroons into the chocolate and place on a parchment- or wax paper-lined baking sheet or serving platter. Drizzle the tops with remaining chocolate and set in the refrigerator (or freezer) to cool until the chocolate is firm to the touch. Store leftover macaroons in the fridge for up to one week and freeze for longterm storage.